Analysis of the LISA Pathfinder mission results towards the end of the mission (red line) compared with the first results published shortly after the spacecraft began science operations (blue line). The initial requirements (top, wedge-shaped area) and that of the future gravitational wave detection mission LISA (middle, striped area) are included for comparison, and show that it far exceeded expectations. At the heart of the LISA Pathfinder spacecraft, two identical, 2 kg, 46 mm gold–platinum cubes were falling freely through space under the influence of gravity alone. The LISA Pathfinder team measured the remaining forces acting on the test masses, and identified the main sources of noise, depending on the frequency. Compared with the initial results following the first two months of science operations, statistical analysis over the larger dataset allowed scientists to measure the noise at even lower frequencies than expected, down to 20 µHz. In addition, the many more months in space allowed a 10-fold reduction in the effect of escaping residual gas pressure inside the spacecraft, which caused gas molecules to bounce off the cubes. More data also led to improved understanding of the small inertial force acting on the cubes caused by a combination of the shape of LISA Pathfinder's orbit and the effect of the noise in the signal of the startrackers used to orient it. A more accurate calculation of the electrostatic forces of the onboard electrical systems and magnetic fields has also now eliminated a systematic source of low-frequency noise. 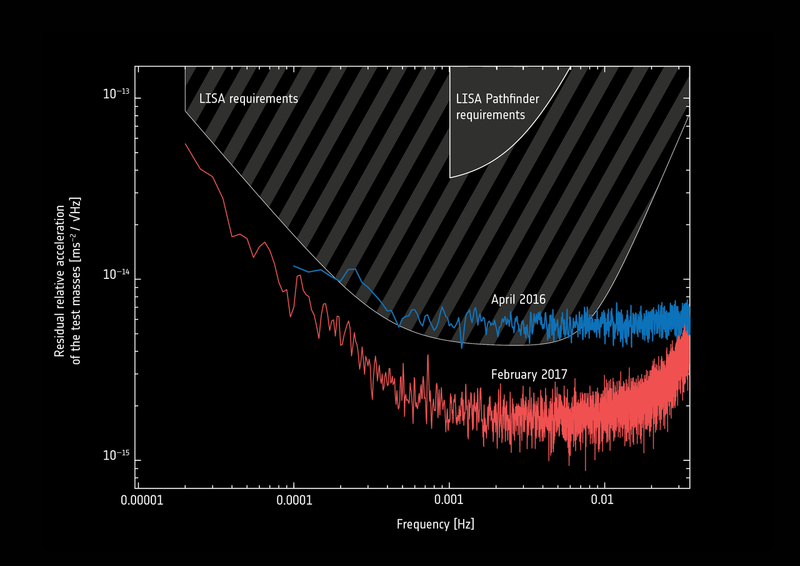 Overall, the results show that LISA Pathfinder has clearly surpassed its original requirements, reaching a level of precision closer to that required by the future gravitational-wave observatory, LISA.